Is Melrose Organic Essential Greens safe for breastfeeding mums? Yes. Melrose Organic Essential Greens is a safe and nutritious food supplement for breastfeeding mums. It’s made in Australia at our TGA-approved manufacturing facility using the highest quality, certified organic ingredients sourced locally and overseas. Organic Essential Greens contains a blend four nourishing greens powders (wheatgrass, barley grass, chlorella and spirulina), and is full of amino acids, vitamins, minerals, antioxidants, phytonutrients and enzymes. It’s 100% natural and free of any chemicals, pesticides, artificial flavours, colours and preservatives. Every batch is tested for heavy metals and environmental toxins and meets Australia’s strict food standards. If you’re unsure about whether a Melrose product is suitable for you, please contact your healthcare practitioner. Do you use Palm Oil in Melrose MCT? No. The MCTs in Melrose MCT are derived exclusively from sustainable coconuts grown in the Philippines. What's the difference between coconut oil and MCT Oil? Coconut oil is the expressed oil from the flesh of the mature coconut. Coconut Oil contains medium chain fatty acids from 6-12 chains in length but most of the fat content of whole coconut oil comes from the C12 fatty acid, lauric acid. Coconut oil and lauric acid itself has many health benefits including improved HDL (good) cholesterol and reducing fat stores but because of the slightly longer chain-length of lauric acid, less is transported directly to the liver when compared to the other MCTs (around 64% vs 90%+). 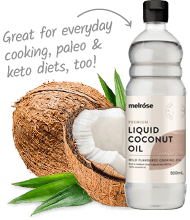 So, while coconut oil is a healthy addition to the diet, which can also help to increase ketones, it is less effective for this than pure MCT oil. Is Melrose MCT a caffeine substitute? While MCTs don’t ‘spike’ energy levels in the same way as caffeine, they can improve energy by providing a non-sugar source of energy for the brain and muscles. MCT is not a stimulant like caffeine so it does not raise heart rate or blood pressure. It can be combined with caffeine (taken together in your morning ‘mct-coffee’) to help boost energy levels and ketone production (caffeine helps to increase the production of ketones, especially in combination with MCTs!). Will MCT Oil boost my energy? Many people who use MCTs report a boost in mental and physical energy. The ketones created when we take MCT oils increase ‘mitochondrial efficiency’ (how efficiently we use fuels, especially using fat-for-fuel) and help to supplement the brain's normal reliance on sugar. Because of this, MCTs have been shown to improve mental performance, energy, and stability of energy. Does your company use palm oil at all? We use sustainably sourced organic palm oil as an ingredient in our Organic Castile Liquid Soap. Do your vitamin products contain gluten? Melrose nutrient powders including our Essential Greens range and our Vitamin C range do not contain gluten. Many Melrose products are vegan friendly including Melrose Essential Greens, Melrose MCT Oils, Melrose Kitchen Oils, Melrose Nut Spreads and Tahini, and Melrose Flaxseed Oils. We have indicated whether a product is vegan friendly on our labels. How much Evening Primrose Oil liquid do I need to get 1000mg? 1.2mL of Melrose Evening Primrose Oil is equivalent to 1000mg, this can also be measured as approximately half a teaspoon. What is the dose for Evening Primrose Oil? The recommended daily dose of Melrose Evening Primrose Oil is 5mL per day. This is easily measured as one standard teaspoon.